Great pokie with 4 standalone rising jackpots. The Mini jackpot starts at $10, as well as the Minor. The Major jackpot starts to rise at $500 and the biggest one called “Grand” will give you at least $5,000. When people play this machine then each jackpot will become higher immediately. 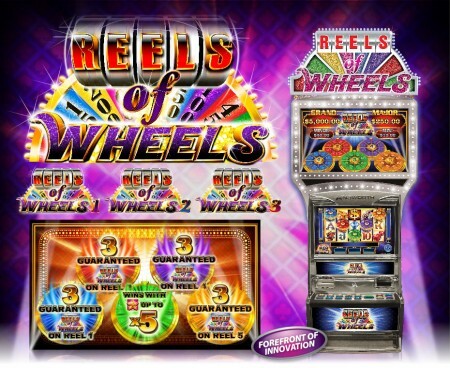 Reels of Wheels is a pokie with many pay lines, 243 to be exact and it can be played with low stakes as well. It has cool bonus features and free spins (sometimes with multiplier). The nicest bonus game is perhaps the wheel of fortune. With hitting this feature a big win is almost guaranteed. Play online at Royal Vegas Casino and receive up to $1200 bonus for pokies now! Reels of Wheels. One of Ainsworth pokie stars. Read more about Australian pokies and gaming rooms.